We made it to Harpers Ferry, WV! We’re here. The place we’ve waited to get to for so long. Check out our photo, now in the official ATC 2013 book. 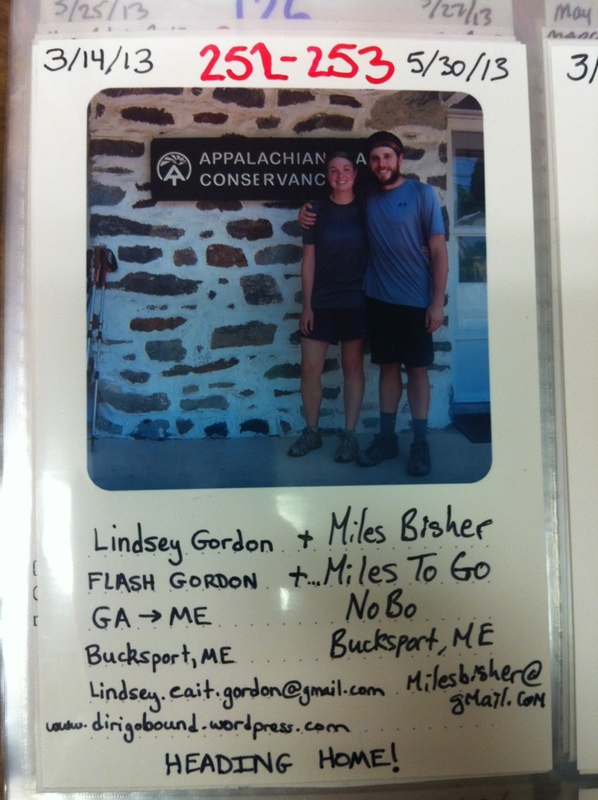 Our new thru-hiker numbers are 252 and 253! nice job guys. I have been folowing you for the whole deal. enjoy harpers ferry, a nice little town. and keep moving. Great job guys! I enjoyed the 187 miles I hiked with you and the other thru hikers. I may head north in a month or so and hike with Handstand for a few weeks. Have fun and be safe my friends! Congrats! Awesome!! I was #252 then they had to remake my photo so ended up 260 something. Enjoy the 1-2 miles out of Harpers Ferry as they will be the easiest on the trail. Again great job, I knew you could do it! YIPPEEE, Congratulations!!!!!!!!!!!!!!!!!!! I’m very happy for you. If you can make it to Harper’s Ferry you can make it to Katahdin. The best is yet to come. Don’t be surprised when you get to Katahdin that you are under 200 checking in, because half the people who check in at HF get off the trail, and many slow down and get sidetracked in New England. You will fly through PA. Camel up in the mornings, water gets scarce from PA through NY. But, the good news is that almost daily you can get a hot meal along the trail all the way to Falls Village, Conn. If just joe meets up with y’all, take it easy on him. And get him to grow out his beard again. Just Joe’s daughter, Keri.